Captain Olimar and The President plucking some Pikmin. Plucking (also known as picking) is how leaders uproot Pikmin planted on the ground. When an Onion expels some Pikmin seeds, these float gently to the ground, where they become buried. Afterwards, a Pikmin seed sprout appears, and from this point forward, the leader is able to pluck it. There is a small delay until the seeds are ready to be plucked, but it is only present in Pikmin and Pikmin 2. To pluck a Pikmin, the player should move the leader near a Pikmin sprout and press / in the first two games, and / / in Pikmin 3 ( in Stylus mode). Upon doing so, the leader will crouch down and grab hold of the sprout. After pulling for a bit, the Pikmin will eventually pop out, with a back-flip in the air, and join the other Pikmin in the leader's party. If the player waits some time before plucking a Pikmin, it will eventually advance in stage, in the following order: leaf, bud, flower. In Pikmin and Pikmin 2, after some time has passed on the flower phase, the Pikmin reverts back to a simple seed; it returns to the leaf stage afterwards. In Pikmin 3, Pikmin just stay in the flower phase permanently. In Pikmin, if the camera's distance is not set to the closest, it will zoom in on Captain Olimar when he begins plucking, and will return to the previous zoom setting some seconds after he stops. This was presumably implemented in order to better show new players how plucking works, up close. It stops once the player has plucked 100 Pikmin. The secret boss in Pikmin, the Smoky Progg, can also uproot Pikmin from the ground as one of its attacks. Pikmin also have the ability to pluck, but instead of other Pikmin, they can only pluck leaves of nectar weed. There is also an e-Reader game that involves having Captain Olimar pluck all Pikmin in a board. A built-in mechanic in the games is the ability for leaders to automatically move from one sprout to the next, without the player needing to move the leader there manually and press the button again. With this mechanic, after each pluck, the leader moves from the current Pikmin to the closest one, even if that involves plucking one from a different type. If the closest Pikmin is too far away, the leader will stop the plucking spree, and if it is behind a wall but within range, the leader will walk against the obstacle, and stop after a second. In the first two main games in the series, the player must continuously press the pluck button in order to activate the automatic mode. Unearthing Pikmin this way also activates the fastest plucking speed, explained below. If the player stops pressing the button, the leader will stop plucking automatically, after the current sprout. The walk from one seed to the next can also be canceled by pressing / . In addition, it is not possible to switch leaders while plucking. Technically, although the recommended method is to rapidly press the pluck button, all that is needed in order to trigger the automatic and quick pluck of the next Pikmin is to press the pluck button once while the leader is grabbing onto the current Pikmin sprout. This is needlessly more precise than the recommended method, which explains why the games and manuals prefer talking about the button mashing way. In Pikmin 3, automatic is the only mode of plucking. Pressing the button once near a sprout will automatically start the process, where the leader(s) pluck all Pikmin, one after the other. During this time, the player can switch control to an different leader and handle tasks with them. Pressing / / ( in Stylus mode) while the active leader is auto-plucking will make them stop their task. To do: Time comparisons would be nice. Plucking each individual Pikmin is a tedious task, so it is recommended to use a few tricks and mechanics that speed up the process, especially when combined. There are two main plucking speeds, which depend on the animation the leader performs. At their slowest, leaders near a sprout will grab on, pull for roughly a second, and pluck the Pikmin out of the ground. If they are in a plucking mode that makes them move automatically to the next sprout, they will do so, and repeat the same slow animation. The faster plucking speed has the leader merely grab the sprout, throw their arms up in a hurry, and quickly unearth the sprout, roughly twice as fast as the slower speed. This animation takes about half a second, and can only be achieved with automatic plucking, so the leader will automaticly move to the next sprout and, again, pluck them with this fast animation. In the first two games, the default plucking animation is the slowest, but by enabling automatic plucking, the leader will automatically move from Pikmin to Pikmin and pull them out using the fastest animation. To note is that the first Pikmin in this automated run is still plucked using the slowest animation. 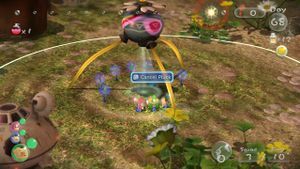 In Pikmin 3, when the player presses the pluck button while their leader is near a sprout, the automatic pluck mode will take place, using the fastest plucking speeds – the first Pikmin is still plucked using the slow animation. Nevertheless, it is possible to activate the slower plucking animations. If a leader is left idle near some sprouts while the player is controlling a different leader (which can happen when they're thrown at the sprouts, dismissed near them, directed to them via Go Here!, etc. ), they will automatically begin plucking, but using only the slow animation for every sprout. This should be taken into account when the player wants Pikmin sprouts plucked quickly. In order to override this, the player may switch to a leader that is plucking slowly, cancel the pluck, and then restart it manually, forcing them to use the fastest animation. Alph, Brittany, and Captain Charlie plucking some Blue Pikmin together. In Pikmin 2 and Pikmin 3, any other leader following the current one will help the latter pluck Pikmin. When the button is pressed, the accompanying leaders will automatically move to and pluck the closest Pikmin, ignoring any Pikmin already being targeted by other leaders. Although the player's leader can use the fast pluck animations, the leaders following them cannot; they will move from Pikmin to Pikmin automatically, so long as the player keeps plucking, but they will only pull out Pikmin using the slow animations. Canceling the pluck will make the secondary leaders stop as well. If playing Challenge Mode or Mission Mode in cooperative mode, it is naturally faster to have both players pluck at once, especially because both leaders can use the fast pluck mechanic. It is, however, normally recommended for the other leader to do something else in the level, in order to maximize the multitasking potential. If possible, plucking should be avoided altogether: if delivering something into an Onion will cause it to spit seeds, it might be faster to withdraw some Pikmin from the Onions before that, so that the number of Pikmin in the field is as close to 100 as possible. This is because the Onion cannot expel seeds if there are already 100 Pikmin in the field, storing them inside instead. It is usually faster to withdraw the Pikmin to the 100-Pikmin cap, deliver the item to the Onion, and, if the Pikmin the player wants are from a different type, re-store the previously withdrawn Pikmin, and withdraw out Pikmin from the type of the receiving Onion. Pikmin being plucked by the Pluckaphone. By far, the fastest way to pluck Pikmin in Pikmin 2 is by using the whistle, after the Pluckaphone has been obtained. This Exploration Kit treasure allows the current leader to uproot Pikmin merely by whistling at them. The Mega Tweeter can also expand the whistle's range, making the task even easier. In Pikmin 3, a peculiarity makes it possible to pluck Pikmin much faster than normal, with the player-controlled leader. The pluck button makes the leader pull out the sprouts, while the whistle button ( in Stylus mode) makes the leader cancel the task altogether, regardless of what they were doing when the button was pressed. This means that it is possible to stop instantly even if they are grabbing onto and pulling out a Pikmin, something not possible in the previous games. Curiously, even if the leader stops while doing so, the Pikmin sprout will still be unearthed. 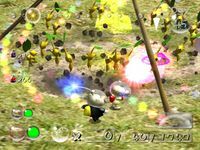 As such, the player can abuse this oddity to pluck Pikmin sprouts much faster than normal, given that they can move on to the next sprout while the Pikmin plucks itself out, effectively bypassing the leader's pluck animation. In Pikmin 2, right after the player has plucked the last Pikmin, the leader enters a state where the button will be used exclusively for plucking, until 9 frames have passed without the button being held down. In other words, this means that if the player plucked a Pikmin, and then continues mashing the button, they will be unable to throw or punch until they let go of the button for a bit. Players who are not paying attention and try to throw Pikmin right after plucking them may find themselves locked out of the throw function because of this. Switching leaders will "unlock" the button, but other than leaving the button alone for a bit, nothing else will, not even pausing. While the button is "locked" in this pluck-only mode, the player can move to a different sprout and pluck it as well, although it will be the usual slow pluck. In Pikmin, if the player is doing an input for moving the group when they begin plucking, the fanfare will not end until the plucking does. This article or section is a short summary on the move Pikmin Pluck. In Super Smash Bros. Brawl and Super Smash Bros. for Nintendo 3DS and Wii U, Captain Olimar's stage entrance animation has him crash into the stage from the S.S. Dolphin and pluck three Pikmin from the ground. His neutral special attack allows him to do the same mid-battle, but only one Pikmin at a time – this move has no effect in mid-air, as a result. In Brawl, Olimar may only have six of his Pikmin on the battlefield at once, but three in Smash 4. If he already has the maximum amount of Pikmin out, the move will fail. 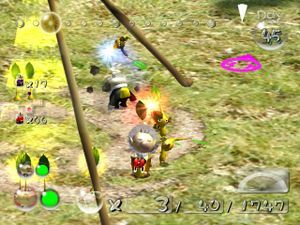 Plucked Pikmin are automatically added to his group. In Brawl, the Pikmin that are plucked are picked at random, although slightly influenced by the type of terrain (water-based platforms have a higher chance of giving Blue Pikmin); in Smash 4, they are plucked sequentially in order. Plucked White and Purple Pikmin make a slightly shorter back-flip, which, when used near a ledge, can allow the player to pluck several Pikmin in a row, and let the Red, Yellow and Blue ones fall off the platform, leaving only the remaining two types. This page was last edited on November 7, 2018, at 22:43.